LUBBOCK, Texas - Billionaire T. Boone Pickens is planning to cash in on the wind energy boom by building the world's largest wind farm in West Texas. The oil tycoon wants to install large wind turbines in parts of four Panhandle counties in a project that would produce up to 4,000 megawatts of electricity. If Pickens' company, Mesa Power LP, does build the wind farm, it would be the largest in the world, American Wind Energy Association spokeswoman Susan Williams Sloan said. It would generate more than five times the 735 megawatts produced at the present largest wind farm near Abilene. One megawatt is enough to power 250 homes in Texas, Sloan said. Pickens' proposal, which would cost as much as $6 billion, would fall just short of nearly doubling what Texas had at the end of 2006, when wind power totaled about 2,700 megawatts, she said. 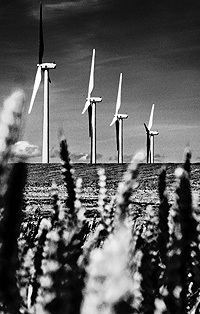 Not all planned wind projects in Texas become reality, though. Earlier this month, a developer who planned to build what would have been the nation's largest offshore wind farm in South Texas called off the project because it didn't make economic sense. Texas, which stood to gain from the project because it owns the submerged land up to 10.3 miles from the state's coast, learned a month ago that Babcock & Brown Ltd., an Australian investment bank, was giving up its 30-year lease on nearly 40,000 acres in the Gulf of Mexico off Padre Island. Construction of Pickens' project would begin in 2010 and involve as many as 200,000 acres in Roberts, Gray, Hemphill and Wheeler counties, said Pickens spokesman Mike Boswell. The farm would have as many as 2,000 wind turbines, and some would be large enough to generate 2.5 megawatts each. Pickens met earlier this month in Pampa with about 250 area landowners. "We have entered into a limited number of agreements with a limited number of landowners to put in some test towers," Boswell said. Landowner deals for Mesa Power were expected to be finalized by the summer's end, he said. Another of Pickens' companies, Mesa Water Inc., has plans to pump water from West Texas and sell it to urban areas. Some landowners who attended the meeting already had sold Pickens the rights to water from the Ogallala Aquifer beneath their land. "We've mated those two together but haven't said you have to have one to have the other," Boswell said. Pickens' wind farm proposal could get help from the state. The Public Utility Commission this week began hearings involving parties interested in developing wind farms and in installing transmission systems. In 2005, Texas legislators passed a law directing the commission to establish Competitive Renewable Energy Zones.